The list of teams that have made the playoffs more times in the last 10 years than the Bengals’ six is short. The list of teams with more playoff wins in that time than the Bengals’ … zero is much longer. In true 27 Dresses fashion, the Bengals were the most always-a-bridesmaid team in the league for most of the last decade, but they have fallen on harder times in recent years, with a combined 19-28-1 record since their last playoff appearance in 2015 and now entering 2019 with a new head coach for the first time since 2003. Still, this is a team that made the playoffs six times in seven years to start this decade span (albeit with only three division titles and one third-place finish that nonetheless earned a Wild Card), and as a result the Bengals have some very good fantasy seasons to look back on. Let’s take a look at the best Bengals fantasy seasons of the last decade. It’s easy to forget this Dalton season, as he’s been only average to slightly above the rest of his career, and his lofty QB3 finish is in part because the QB position overall was down after Peyton Manning and Drew Brees at 1-2. Regardless, he was the No. 3 fantasy quarterback in the league for an entire season, and no caveat can take that away from him. His last two seasons have been his worst for fantasy since joining the NFL, so the Bengals might be nearing the end of the Dalton tenure, but it’s been a good one, all things considered. As I was compiling this list, I tried to guess each one before finding the answer, and it never occurred to me that Mixon’s 2018 would lead the Bengals backs. My guess was Jeremy Hill’s 2014, but I would have guessed one of his or one of Giovani Bernard’s or even one of Cedric Benson’s. But Mixon’s not only led the way, it did so by more than 20 points. That is as much because of the Bengals’ relatively middling RB play over our span (Mixon’s 2018 would only have led the Jets and Lions over that span in addition to the Bengals) as because of Mixon’s own dominance, but the second-year back showed he has the skills to be an RB1 in the league. You obviously knew Green would be the pick for the Bengals, but the exact season might have been tougher to identify. Green’s 2012 and 2015 were close runners-up as well, but it was his 2013, with a career-best in receiving yards and a career-best-tying touchdown total, that sets the mark here. Green has appeared more injury-prone in recent years, and with the ascension of Tyler Boyd, he isn’t likely to ever break that mark, but it can’t be ruled out. Either way, Green is on a potential Hall of Fame track. Eifert’s fantasy draft stock has stayed high for multiple years now almost entirely because of this one year, when he finished as an easy TE1 despite missing three games. But of course “missing games” is kind of Eifert’s oeuvre, as he has played a total of 14 games across the three seasons since that big season, with only 619 yards and six touchdowns to show for it. Eifert’s performance in 2015 was largely because of an obviously unsustainable 13 touchdowns on 66 targets, but even a small slip would have kept him relevant for years if he could have stayed healthy. 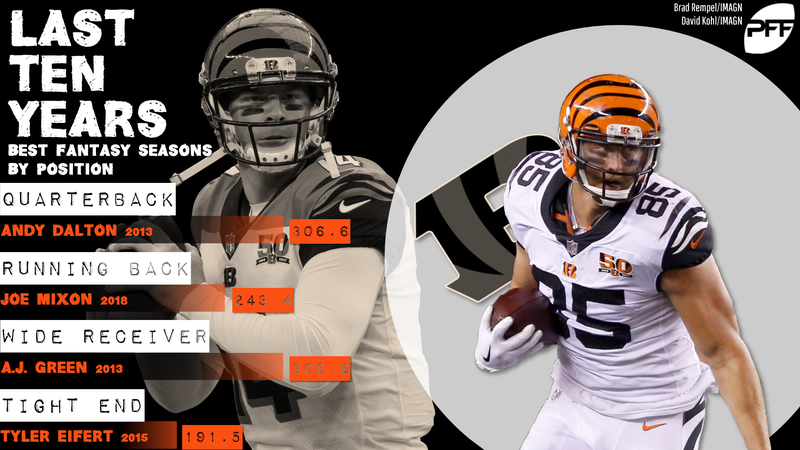 Now recovering from yet another injury and entering free agency, we’ll see if Eifert can regain any fantasy stock at his next stop in the league.